Students, their family members and school officials are pictured at Monday’s Greenfield Board of Education meeting where winter sports participants and FFA students were honored. 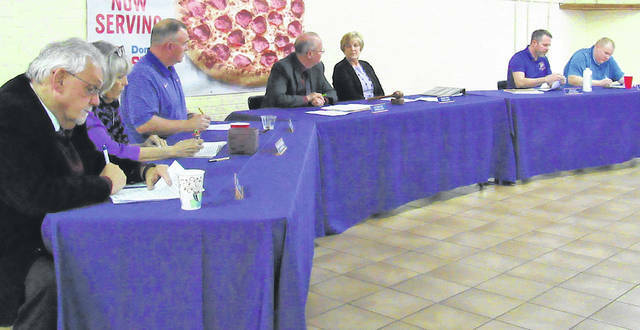 Pictured at Monday’s Greenfield Board of Education meeting are, from left, treasurer Joe Smith, board members Marilyn Mitchell and Jason Allison, interim superintendent Ron Sexton, board president Sandy Free, and board members Eric Zint and Charley Roman. Greenfield school officials have met with a design firm about a new athletic facility for the school district, Interim Superintendent Ron Sexton said at Monday’s board of education meeting. On the matter of improvements, Sexton said he has met with Greenfield City Manager Todd Wilkin twice regarding Mitchell Park, which is owned by the village and used by the school. 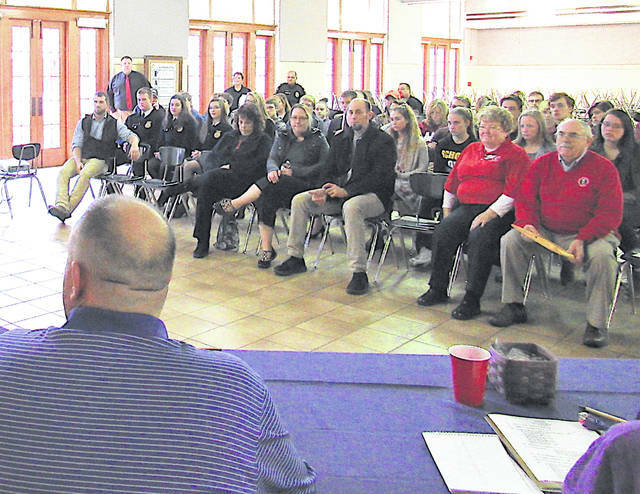 He said that after the baseball and softball seasons, and after summer ball programs have concluded, there will be some major improvements planned at the park, and funding sought through grants in a concerted effort of the school district and the village of Greenfield. Otherwise, it was mostly an evening of recognition as board members honored students and board president Sandy Free was recognized by the Ohio School Board Association (OSBA). The meeting opened with Ron Diver and Linda Jordan with the OSBA recognizing board president Sandy Free for her 15 years of service as a board member and her continued dedication to the district. Next up were the McClain FFA students, who gave a presentation highlighting what the organization is, its numerous community involvements, the impact it has, and the different opportunities available for those involved. According to the students, the McClain FFA Chapter each year logs more than 1,000 hours in community service endeavors. Those projects include a Secret Santa program for underprivileged children, a Children’s Christmas put on every year for elementary students, making dog toys for the Humane Society, and preparing and delivering meals for first responders, to name a few. The students also talked about the “life-changing opportunities” that are possible through FFA and how it is not just for kids that live on a farm, but offers something for everyone. McClain FFA Advisor Chris Fitzpatrick thanked the school board and administrators for their example of leadership and their support of the FFA, which allows the students’ enriching experiences to be possible. Student athletes involved in winter sports programs were all recognized for their achievements, dedication and hard work in their respective sports. Included in the recognitions were students who made all-district, as well as the coaches that led them. Among the items approved on the consent agenda was the resignation of high school counselor Dan Raike for the purpose of retirement effective June 18, 2019; the addition of a supplemental contract for an assistant wrestling coach; approval of next school year’s calendar; and the employment of an additional elementary school guidance counselor. Sexton commended board members for their approval of the additional elementary guidance counselor, saying that he believed “in a district of high poverty and high need,” having another guidance counselor will help “catch” any particular needs earlier, which is better for the students later. Sexton also recognized the Quick Recall team for its recent placement at the state level. In his report to the board, Smith mentioned a hearing held Monday by the state’s finance subcommittee on primary and secondary education, saying it was viewable to the public online. For those interested, at ohiochannel.org there are numerous options for viewing state house activities, including archives and a broadcast schedule at the bottom of the page. Also approved on the consent agenda was the purchase of two new school buses, each for $94,820. The buses will include added safety features like reflective chevron striping on the rear, electronic stability control, and ground perimeter lighting, according to Transportation Supervisor Bradley George. The search for a permanent superintendent continues as board members have met in several special meetings since last month’s regular meeting to conduct interviews and narrow the field of applicants for the position. There has been no word yet as to when they expect to make a decision. Employment recommendations approved by the board were Matt Shelton, high school assistant principal, three years; Alisa Barrett, curriculum director, three years; Kevin Little, school resource officer, three years; Ashley Rowland, high school Spanish teacher; and certified substitute Lana Cherrington. The Greenfield Board of Education is scheduled to meet again in regular session on April 15 at 7 p.m. at Buckskin Elementary.